It’s no secret, guys can be hard to shop for during the holidays. To make the task a little easier this year we have put together four collections of gifts for men in our #stmAPPROVED Holiday 2015 Gift Guide. Take a look below to get inspired and find out where to buy the gifts he will love. 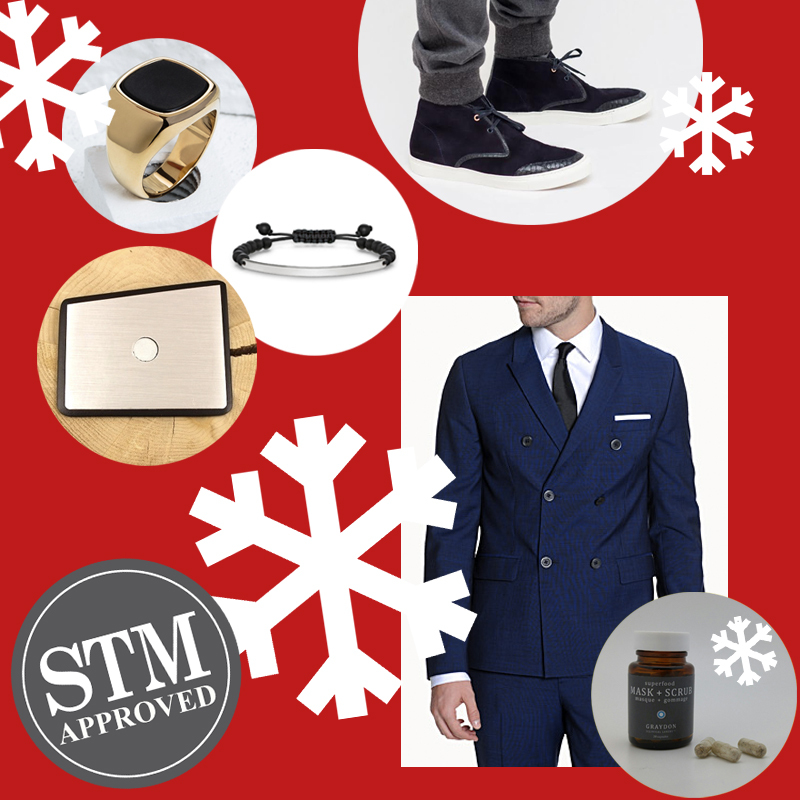 Be he a Gentleman, a Creative Director, a Quirky Dude or an Urban Hiker, we have lots of #stmAPPROVED gifts to wrap up and put under the tree for him. He takes care of his appearance and wants to make a good impression. He likes to accessorize with a touch of tasteful bling and is not afraid of a double breasted jacket. You’ll find him this holiday toasting the season at fun cocktail parties and sipping drinks in some of the city’s newest lounges. Ring: Vaurus x Gold ring from Vitaly. Help him stand out with this signet ring placed on his pinky or index finger. $66. Get it here. Bracelet: Black Beaded Love Bridge Bracelet from Thomas Sabo. Express your feelings to him with a free of charge engraving on the 925 Sterling Silver section of this unisex bracelet. $134. Find a store here. Wooden Pocket Square: Silver Member from Baffi. Tell him to lose the hanky and be sharp with this Canadian hand-crafted pocket square made from cocoa bean wood featuring silver mylar fill. $50. Get it here. Shoes: The Navy Earl Chukka from NobleSole. For a more relaxed yet luxurious look featuring navy suede and croc with rose gold accents, help him slip into this sneaker disguised as a chukka boot. Reg. $229, Sale $159 at publishing. Get it here. Jacket: Glazed Broadcloth Double-Breasted Blazer from Le 31 for men at Simons. Give him a modern look with this 100% italian virgin wool slim fit double breasted blazer is this season’s sophisticated evening out blue. Reg. $275, Sale $199.95 at publishing. Get it here. 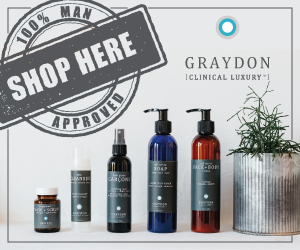 Pill Format Face Scrub: Superfood Mask+Scrub from Graydon Clinical Luxury. These pre-portioned single serve capsules keep their enclosed superfoods fresh. He can twist open one capsule and blend contents into any creamy cleanser to create his favourite new facial scrub. 20 capsules $39, other sizes available. Learn more and get it here. His creative job keeps him at the office way past 5 o’clock but he loves what he does and you have to admit he has some talent. Meeting with clients often he needs some smart looking eyewear and a fashionable coat to illustrate his understanding of design. He’s constantly on his smart-phone and needs to make sure it’s protected at all times. Eyewear Frames: Hanson Matte Classic from Bohten Eyewear. Made from sapele wood which is re-purposed from discarded furniture and cabinet parts, these frames not only show off his style but that he cares about the environment. To make it better, for each pair sold, a donation is made towards Sightsavers’ global work in developing countries. $Reg. $130, Sale $95 at publishing. Get them here. Boots: Montbard Chukka from Lacoste. Keep his feet stylish in these ready for the urban outdoor elements Chukka boots. Reg. $275, Sale $199.98 at publishing. Get them here. Skin and Beard Care: Men’s gift box from Vichy. Includes 1) VICHY HOMME HYDRA MAG C+ a moisturizer for his face and eyes to reduce signs of fatigue, dark circles & puffiness. 2) VICHY HOMME IDÉALIZER 3-DAY+ BEARD WEARER a multi-action moisturizer that hydrates and diminishes signs of aging while soothing his skin and softening beard hairs to facilitate grooming. Suggested retail $42.50. Find it at major drugstores across Canada. Drink: Grand Marnier Louis Alexandre. He can toast the new year in with this fine drink featuring a complex and masculine taste he is sure to enjoy and his guests will comment on. Suggest he serve it after dinner with ice or as a Manhattan or Old Fashioned. $69.95 Get it here. Privacy Screen Protector from Phantom Glass. Keep his phone screen private and impact and scratch resistant with revolutionary Phantom Glass, the last screen protector he’ll ever need! Available for iPhone and iPad. iPhone 6/6S $49.95. Get it here. Coat: Long Line Utility Jacket by Sixth June at Le 31 for men at Simons. This military inspired jacket is cut in a longer parka like length to keep him safe from those nasty blasts of northern winds whipping down the street. The metallic zip closures and long gathered seaming in the back will instantly make this jacket his most stylish. $150. Get it here. He is fun and relaxed and wants to take you up to his family’s cottage next weekend. An admirer of plaid, he loves to boast about the great city he lives in and prefers to make his coffee at home, instead of going out to get it in a “red cup”. Shoes: Chuck Taylor All Star Street Hiker Woolrich by Converse. He can wear these on that hike he will take you on up at the cottage. Their upper flannel will keep his feet warm while the improved grip outsole provides him traction on the trail. $109.99. Get them here. Bag: Tribute to Rene Zippered Backpack from Lacoste. He can pack hiking essentials in this sporty vintage backpack or maybe just use it to carry his books to class. $115. Get it online here or find a store here. Mug: Buffalo Check Ceramic Mug to support Canadian Women’s Foundation. He can feel good sipping his dark roast from this mug knowing that net proceeds went to support Canadian Women’s Foundation. $5.99. Find it at Winners and HomeSense Canada. Hat: City of Neighbourhoods Unisex YYZ/True North Toque by Tuck Shop Trading Co. for Over the Rainbow. Grab him one of these super limited edition toques and tell him good luck finding the other 29 people with the same hat somewhere on earth. $40. 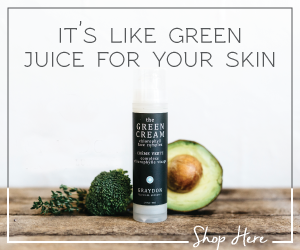 Find it online here or in store. Skin Care: Face Mask Gift Set from The Face Shop. He wants to stay in Sunday afternoon and do nothing. Perfect time to do face masks together! Nab 15 of your and what you are sure to be his favourite face masks from The Face Shop and customize your own gift box. Make sure to take selfies and tell him how you really feel. $20. Find it online here or find a store here. Sweater: Nordic Jacquard Sweater from Le 31 for men at Simons. Perfect for cuddling up with Net Flix, this sweater features the silhouette of a boreal forest in a soft faded grey. Reg. $78, Sale $59.95 at publishing. Get it here. He hangs out with the guys often and they are usually headed to a concert somewhere in the city. His style is dark, moody and urban. After work he likes to meet you at a local micro brewery and sample their latest batch. Shave: Urban Shave Kit from Inspired Soap Works Limited. Keep his face soft and his shave clean. This hydrating shave soap bar is made of olive oil, shea and cocoa butter and various essential oils. Comes with a travel tin and brush. $18.95. Get it here. Pendant: Gold Road from Clocks and Colours. He will love the story behind the name of this piece of jewelry. Gold Road was a route that connected the Pacific and the Atlantic Oceans by cutting through Panama. Used mostly for transporting gold, ships on this route were often attacked by pirate vessels. Comes hanging on a 25 inch stainless steel chain. $120 in stainless steel or $155 in silver. Get it here. Boots: Montbard Boot from Lacoste. He’ll be ready to walk all over the city in the winter elements in these rugged boots. Reg. $285, Sale $227.88 at publishing. Get them here. Sunglasses: Jetter Classic from Bohten Eyewear. He can reflect on the past year in the polarized mirror lenses of these classic sunnies made of recycled rosewook, titanium and ebony. $209.99. Get them here. Sweater: Vintage Heathered-Knit Cardigan from Le 31 for men at Simons. 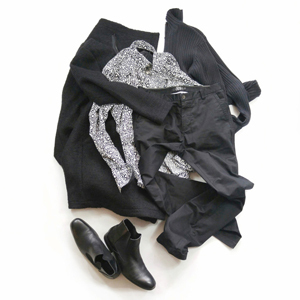 This ultra soft wool cardigan features an inward-woven heathered knit for an inside-out look with faux leather elbow patches. It will instantly become his go to sweater all winter long. $78. Get it here. Thanks for checking out the #stmAPPROVED Holiday 2015 Gift Guide. Be sure to follow us on instagram, @stephenthomasm and watch for more #stmAPPROVED items. Happy Holidays!